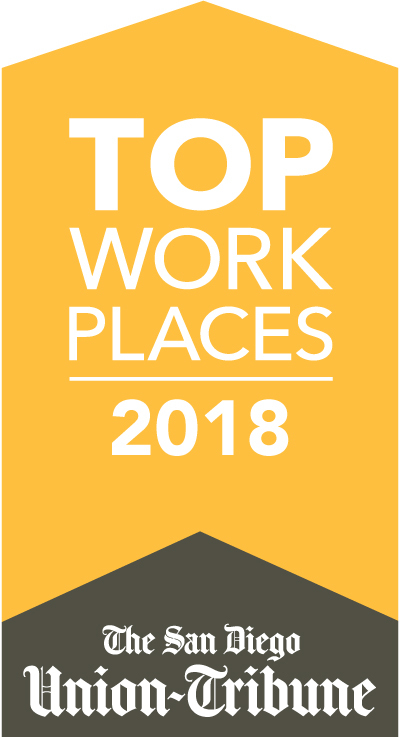 November 11, 2018 (San Diego) – Procopio was named today by the San Diego Union-Tribune as a winner of the 2018 Top Workplaces Award. The awardees are selected solely on employee feedback through the results of an anonymous survey, which measures aspects of workplace culture including employee engagement, alignment of work with mission, and company leadership. Procopio was the only law firm named to the Top Workplaces list. A total of 70% of Procopio’s staff and non-equity partner attorneys responded to the survey, conducted by the Union-Tribune research firm Energage, LLC. That participation percentage exceeded the survey average of 60%. Ten Procopio attorneys and staff discuss the firm’s workplace culture—from diversity and inclusion to work-life balance issues and professional development—in a new series of short videos found at www.procopio.com/life-at-procopio. The San Diego Union-Tribune Top Workplaces Award is not the only recognition Procopio has received this year related to its employees. For the second year in a row, Procopio was named a Top Ten Law Firm for Diversity among AmLaw 200 firms. Learn more at www.procopio.com/diversity.